A bold collection of 3D printed shoes that are meticulously designed and constructed to fit the natural shape of the foot. One of the most popular posts of 2018 was this one about Ica & Kostika’s 3D printed Mycelium Shoe. Now, the footwear brand is back with an entire collection in case that first one was a bit too daunting to think about wearing. The Exobiology collection features a variety of bold shoes, all 3D printed, that are meticulously designed and constructed to fit the natural shape of the foot. 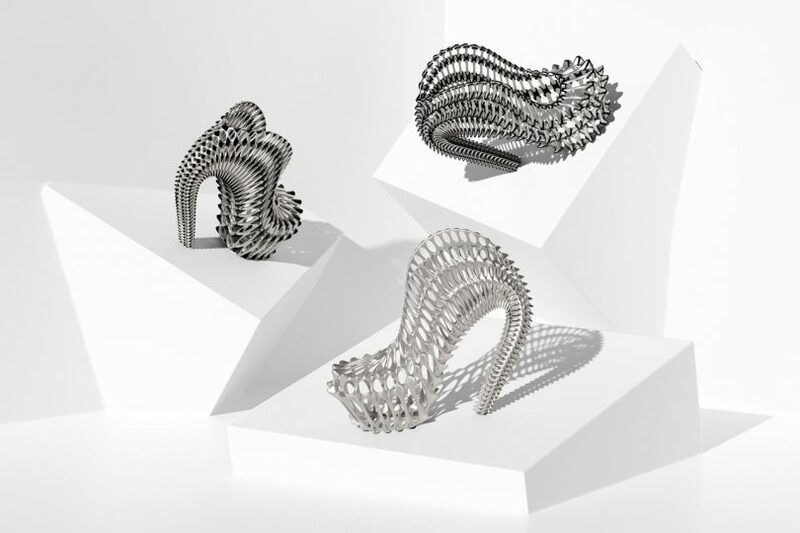 The Seahorse shoes have an intricate skeletal structure that resembles that of a seahorse. The scale of the structure evolves, changing in scale as it goes from the toes up the foot and into the heel. Available in a variety of materials and hand-painted finishes. The Spine shoes feature vertical vertebrae that rise up and curve over the toes for a dramatic silhouette. They come in three finishes: silver, white, and black chrome. The Coral shoes mimic the look of sprawling sea fans while managing to still appear delicate in structure. There are three variations that come with their own branching structure. The Mycelium shoe probably looks familiar as that’s where it all started. The design was inspired by “the radial growth of the mycelial branching from mushrooms” and it’s now available in three styles: a wedge, a heel, and the super bold heel-less version.